Who Will Be the NFL’s Next Passing Yards King? Monday night, Drew Brees became just the 10th quarterback in NFL history to hold the career passing yards title. Brees has long been the NFL’s most consistent QB, so it was no surprise that he bypassed the previous record of 71,940 yards set by Peyton Manning, who held the title for just three years. With Brees now the NFL’s passing yardage king, it’s time to look ahead and ask: Who will be the next quarterback to break the record? Before we can look at who’s in line for the title, a problem needs to ironed out: Brees is still playing, raising the bar with every completed pass. So we need to estimate what Brees’s final number will be. For the sake of math, let’s assume the 39-year-old Brees will play out the rest of this season and then retire. Based on his career average of passing yards per game (283.9), he should finish this season with roughly 75,000 career passing yards. Of course, Brees, who has said he doesn’t know when he’ll retire, could play well past this season, but assuming a retirement at the end of 2018 gives us a conservative estimate for the number NFL QBs will have to top to become the next passing yards leader. And even when estimating conservatively, it’s immediately clear how difficult it will be for anyone to match Brees—and that it would be almost impossible for another QB to do so as quickly as Brees passed Manning. If I had to bet on one player to be the next passing yardage leader, my money would be on Ryan. The 2016 MVP has missed just two games in his career, and if he continues to play at the rate he has over his 11 seasons, he’ll break the passing yards record by the end of the 2025 season. He’d be over the age of 40 then, but seeing as that’s just a little more than seven seasons away, he has the quickest path to breaking the record that’s still realistically within a player’s expected career length. Things will look even rosier for Ryan if he’s able to pick up the pace, which he (along with just about every other quarterback) has done this season. Ryan’s thrown for 320.2 yards per game through his first five contests, which will be by far the highest mark of his career if he maintains that pace; it’s a full 11 yards per game better than his MVP season. If Ryan starts turning in seasons like this one, he’d break the record in a little more than six seasons, when he’ll be 39. Stafford is a very close second. The Lions passer began his career when he was just 21 years old—young enough to get off to a breakneck start despite missing 19 games over his first two years in the league. Stafford hasn’t missed any time since his sophomore campaign, and given his usual rate of production, he could break the record by late 2026 or early 2027—well before he turns 40. While Detroit’s lack of a running game or a defense during Stafford’s tenure hasn’t aided the team’s win totals, it has been a buoy to Stafford’s numbers. He’s been charged with chucking the ball at virtually every opportunity—a similar role to the one Brees has played on a majority of his Saints teams. Detroit’s need to throw the football has given Stafford some gaudy passing stats: He had a 5,000-yard season in just his third year in the league, and he’s cracked 4,000 passing yards in every healthy season of his career. Stafford is a particularly promising candidate because he finished last season with 34,749 career yards—the most of any QB before their age-30 season. That’s more than 8,000 yards ahead of what Brees had at the same age. But then again, the fourth-place finisher on that list is Drew Bledsoe, who himself had more than 3,000 more yards than Brees did at that age, and he was out of football by age 34. For Stafford to break the record, he’ll have to be around into his late 30s—which isn’t a guarantee. Despite the five-year megadeal he signed last August, Stafford’s had only one Pro Bowl appearance in nine seasons, and he could be a candidate to make a Bledsoe-like exit from the league. But if he continues to be the Lions starter, Stafford is as well positioned as anyone to someday break the record. Brady is by far the closest active player to Brees—he’s the only other one who has eclipsed even the 55,000 mark. But he’s also a year and a half older than Brees. For Brady to have a crack at the passing yards record, he’d have to keep playing at his usual level through at least 2019. No QB has ever thrown for more than 2,000 yards in an age-42-or-older season, and Brady would need about 5,000 at that age next year to touch Brees’s mark. And that all centers on the big if of Brees retiring at the end of this season, which, again, is a conservative estimate. Even with his TB12 method, Brady’s age may put him out of reach. Meanwhile, can you believe that Rodgers has fewer career passing yards than Ryan? Rodgers’s career got off to a slow start—he sat behind Brett Favre for his first three seasons and didn’t start a single game—and since becoming Green Bay’s starter, he’s missed another 17 games due to injury. That’s a four-season deficit that looks nearly impossible to make up, even for someone as prolific as Rodgers. Instead, he’ll likely have to settle for setting the passer rating record. He’s just a quality-over-quantity type of QB. If Luck hadn’t missed all of 2017 and another 10 games between 2015 and 2016, he’d be up in the contenders tier with Ryan and Stafford. Luck is prolific when he’s on the field, and he’s had the same advantages (or disadvantages?) that Stafford and Brees have often had: virtually no running game or defense to support him. In fact, this season Luck leads the league in passing attempts as the Colts have fallen behind early and often. 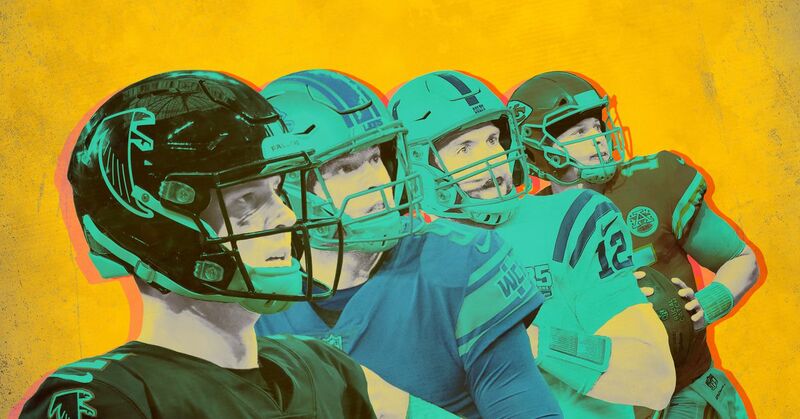 If Indianapolis continues to field mediocre squads built around little more than its quarterback, Luck should be able to claw his way into the passing yards conversation. The only question will be his health. Luck just missed an entire season with a shoulder injury, and instead of easing him back in slowly, the team has tasked him with chucking the football more than any other passer in the NFL. Indianapolis has yet to find the balance between leaning on its elite quarterback and running him into the ground. These three are too close to retirement to make a real run at the passing yards title. It’s silly to speculate about players with so little experience, but if any of the NFL’s youngest passers are going to have a chance to someday hold the passing yards belt, it’ll likely be one of these four. Mahomes gets a boost due to his ludicrous average of 299.5 yards through six career games. Watson is also on a decent pace, though, like every passer, he’ll need to stay healthy—which means the Texans will need to fix that wet piece of cardboard they call an offensive line as soon as possible. Goff’s per game average is brought down by his seven rookie-year starts under Jeff Fisher, in which he threw for just 155.6 yards per game. This season he leads the NFL in passing, and if Goff and head coach Sean McVay stick together long term, they could shatter all sorts of records. Wentz is hurt some by the fact that he began his career at the ripe old age of 23, but he’s talented enough that he could pick up the slack. You could also throw any of the NFL’s rookie passers into this category. Even the young QBs that are off to a slow start (like Josh Rosen and Sam Darnold) are far from doomed; Brees didn’t start a single game his rookie season. Jokes aside, there’s a reason Bortles comes out looking good here. He won Jacksonville’s starting job by Week 3 of his rookie year, and before last season had to throw the ball constantly, as the lowly Jaguars frequently fell into early deficits. Even this season, Bortles is averaging more than 300 yards per game through five weeks, which would be the highest total of his career should he maintain that pace. So, given these numbers, he has a mathematical shot at challenging the record. But Bortles is still an extremely unlikely candidate. On his current career pace, it’d take him roughly 15 seasons to do it, and he can be incredibly inconsistent. It’s hard to see him holding down a starting quarterback job well into the 2030s. So while Bortles is technically in the running, I’ll just put his chances this way: If he ever holds the passing yards record, I’ll name my next-born child Blake.